The Oklahoma Aeronautics Commission (OAC) is a unique state agency in that we have the statutory authority to "draft and recommend legislation to advance the interests of the state in aeronautics" (Title 3, Section 85, F. 1.). OAC accomplishes this objective by legislative action presenting initiatives to the Oklahoma Legislature. As a non-appropriated agency, the Aeronautics Commission does not rely upon annual appropriations from the Oklahoma Legislature in order to function. Instead, the Commission is funded by a dedicated 0.0008% tax on motor fuels bought for aircraft use and a dedicated 3.25% tax on the purchase of aircraft. Those two dedicated taxes make up 80% of the Commission's annual budget. The remaining 20% comes from federal grants and other fees for the Commission's services. About half of that budget is dedicated to providing assistance to local airport improvement projects. The remainder is used to operate the agency and to provide educational activities to inform the public about aeronautics. This compels us to ensure the Oklahoma Airport System infrastructure will be here for far reaching future generations of the flying public. The Aeronautics Commission is under the supervision of the Secretary of Transportation. Under current Governor of Oklahoma Kevin Stitt, Tim Gatz is serving as the Secretary. We have close communication with Secretary Gatz regarding our legislative initiatives ensuring that state ideas are in harmony with the Executive and Legislative branches of state government. 2017-Requiring inspection of all public-use airports to ensure aviation safety. 2017-The first state to establish Women in Aviation & Aerospace Day to commemorate the contributions of women to Oklahoma aviation and aerospace. 2014 - Requiring marking of MET (wind evaluation) towers to ensure aviation safety. 2013 - Led effort to keep 6 air traffic control towers open to ensure aviation safety and the continuation of commercial service in Lawton. 2010 - Aircraft Pilot & Passenger Protection Act providing state zoning authority to protect all public-use airports, including military airports, while facilitating compatible development. 2008 - Tax credits for engineers hired by aerospace employers and the employers hiring them. Has significantly helped Tinker, FAA, Boeing, Spirit, NORDAM meet engineering needs. One of top 3 reasons cited by Boeing for moving 2,000 engineers to Oklahoma. 2005 - Eliminated sales tax on all aircraft repairs, giving OK companies a competitive advantage, critical to Oklahoma remaining one of the 7 centers in the world for the maintenance, repair and overhaul of aircraft. Oklahoma has the largest military (Tinker AFB) and commercial (American Maintenance Base) aircraft repair facilities in the world; and the largest independent MRO provider in the world. The measure provided more specificity as to the use of aircraft related to exemptions to the aircraft excise tax. In particular, the provisions were directed toward the actual use of aircraft for charter activities. With a limited number of airports in the state hosting charter activities, it is anticipated that audit efforts would be manageable and increased compliance with the aircraft excise tax was possible. The Incentive Evaluation Commission indicated in its November, 2016 report that all exempt sales of aircraft resulted in foregone revenue on excess of $3.7 million to the state. This bill would have put in place a requirement like 23 other states that 50% of the operations of the aircraft be charter. Twelve states don't even allow this exemption, and twelve states only allow it the actual charter certificate holder (owner). Kentucky requires that in order to receive the exemption, the operations of the aircraft must be 100% charter. Maine requires 80% the first two years and 50% thereafter. Oklahoma is the only state that has no requirement. The bill would have required Part 135 aircraft to operate at least 50% of its annual operations and requiring that said operators do not own a majority interest in a business entity in which the aircraft is registered to. During the 2010 legislative session, HB 2919 by Rep. T.W. Shannon was enacted into law. The measure created the “Aircraft Pilot and Passenger Protection Act” (APPPA). It provided legislative intent to regulate the height of structures near public-use airports. It also required a person to obtain a permit from the Oklahoma Aeronautics Commission prior to the construction, installation or alteration of any structure near a public use airport under certain circumstances. It provided conditions under which a structure is presumed to be a hazard to air navigation. It also required notice prior to and application for a permit from the Aeronautics Commission and to file a permit with the county clerk. It established a misdemeanor crime punishable by a fine of $500 for failure to obtain permit. It allows the Aeronautics Commission to assess up to $200 per permit application and authorizes Commission to promulgate rules. HB 2179 streamlined the statute, ensuring an efficient permitting process for those who have to apply and to update existing language to ensure it is in line with current airport industry standards. Section 3, paragraph B(1): Adding an item to exempt temporary structures. Under APPPA originally, we did not intend to permit temporary structures. With this new language we added a specific item that states temporary structures that are in place less than 24 months do not require a permit from OAC. We ran into this problem at an airport in eastern Oklahoma where someone was placing a piece of mining equipment (that was going to sit idle and not operate as part of the mine) that did not fall within the existing item for mobile or temporary equipment. A permit for such a temporary structure should not be required as APPPA is intended to apply only to permanent structures. Section 8, paragraph (4): This language will allow for issued permits to be amended for the purpose of micro-siting a structure. This is a specific request of several companies we have issued permits to over the 6 year history of APPPA. During the application process a company will submit the coordinates and elevations of the structure based upon surveys. Once the actual contractor who is building the structure gets into the field, they might need to move the structure several hundred feet in one direction of the other based upon the existing circumstances of the terrain. We feel this is a legitimate request by these companies as these minor movements (called micro-siting) typically do not interfere with the airport approach surfaces. Section 2, paragraph (8) and Section 3, paragraph (1): This language will update items in the definition of incompatible use to ensure it is in line with national standards for airports. The changes will add in specific items such as a place of assembly (golf course, sporting field, etc. ), transportation facility (roadway, parking lot, etc. ), and storage facility (fuel tanks, waste-water holding tank, etc.) among others. This will bring the definition of incompatible use in line with airport standards for what should and shouldn’t be located within the confines of the primary surface (immediate area within 500 ft of the runway) and the runway protection zone (extends approximately 2,500 ft from the end of the runway). These are the locations that have the highest chance to see an aircraft crash during an emergency (either on takeoff or approach to landing) and should be as clear as possible to protect both those on the ground and those in the aircraft. There have been several instances of confusion with local airports because their requirements specifically address the above items, but APPPA does not. Section 5, paragraph (1): This language will extend the amount of time a person has to file an approved permit in the county clerk’s office and return a copy to OAC from 30 days to 60 days (this was a request of businesses who have been issued permits). Section 1, paragraph (D) and Section 2, paragraph (17): This language will ensure that any survey standard adjustments are based upon FAA standards (e.g. only adding the survey adjustment when the structure in question impacts the instrument approach surface). The two companion measures directed the Oklahoma Aeronautics Commission to administer an airport inspection program for all public-use airports within the state of Oklahoma. The measure required all airport owners to provide access to airport facilities for conducting inspections. Finally, the measure required the commission to submit a written report to each airport detailing the findings of the inspections. OAC currently inspects all public-use airports to ensure state airports are safe for the flying public and collect vital airport safety data for various aviation publications (sectional chart, airport directory, etc.). These public-use and private public-use inspections are currently conducted under an agreement between the Federal Aviation Administration (FAA) and National Association of State Aviation Officials (NASAO). The surface environment at all airports, and specifically General Aviation (GA) airports, are challenging to develop and deploy runway safety solutions that benefit everyone. NASAO partners with FAA to seek best practices for runway safety. OAC Airport Inspectors perform these Safety & Standards inspections to determine if an airport meets FAA and OAC standards as well as collect vital airport safety data. These inspections help Oklahoma’s municipalities with the technical expertise on how to operate, develop, and maintain an airport. While at the airport during these inspections, OAC will provide technical assistance to municipalities with the development of their short, medium, and long term capital infrastructure plans. Oklahoma was first in the Nation to recognize, in state statute, the contributions of women in the aviation and aerospace industry. The measure established Women in Aviation and Aerospace Day in Oklahoma on the 9th day of December of each year. The date was selected to honor Pearl Carter Scott, from Marlow, Oklahoma, After learning how to drive at the age of 12, Scott soared to new heights and learned to fly at the age of 13 under legendary aviator Wiley Post. She became the youngest pilot in the United States with her first solo flight on September 12, 1929. She later worked as a stunt pilot.. Oklahoma abounds with famous female aviators. The 99s Museum of Women Pilots is in Oklahoma City and is the headquarters for the 99s organization. They boast one of the largest collections of artifacts and information solely dedicated to women pilots. The museum is operated by The Ninety-Nines Inc, an international organization of women pilots established in 1929 with Amelia Earhart as the first president. This bill will be a foundation for focus on a declared date to plan events highlighting airports, women’s contribution to aerospace companies, famous female aviators in the past and present, and to bring the excitement of aerospace exploration and learning to young women throughout the State of Oklahoma. The measure established Aviation and Aerospace Day in Oklahoma each year on August 19th, which is also National Aviation Day. National Aviation Day is observed in the United States each year to celebrate the history and development of aviation. It coincides with the birthday of Orville Wright who, together with his brother Wilbur, made significant contributions to powered flight. Oklahoma established a rich aviation and aerospace heritage when some of the first commercial airlines began here. Aerospace manufacturing soared with the making of WW II bombers in both Oklahoma City and Tulsa. The state was key in the space race with the manufacturing of parts for Gemini, Apollo, and the space shuttle, and Oklahoma boasts more astronauts per capita than any other state. On aviation day, Oklahoma schools will be encouraged to organize classroom activities that focus on the topic of aviation. Activities such as discussing aviation history, including the efforts of the Wright brothers, Amelia Earhart and other aviation pioneers; and engaging in interactive tasks about airplanes and other means of flight transport, as well as careers associated with the aviation industry, would be appropriate. Aviation enthusiasts and students may visit museums about aviation history and technology in Oklahoma such as the Tulsa Air and Space Museum in Tulsa, the Stafford Air & Space Museum in Weatherford, or the 99’s Museum of Women Pilots in Oklahoma City. The Oklahoma Aeronautics Commission will focus on encouraging and assisting the 109 airports comprising the Oklahoma Airport System to hold festivities and conduct first-flights for school children, host an open house, or provide airport tours on this day. Oklahoma’s aircraft registration fees were established in 1976 by the legislature based on motor vehicle registration in the state. For over forty years aircraft fees had remained unchanged. SB 433 adjusts the fee schedule for inflation through a 50% increase across the board to the aircraft registration fees while keeping registration at affordable rates for aircraft owners. The fees are paid by its users and go back into the Oklahoma Airport System. The needs for the 110 public airports that comprise the Oklahoma Airport System (OAS) for the next 20 years are $1.8 Billion. There will be a shortage of $800 Million insofar as the 20-year needs of the OAS is concerned, $550 Million for the 107 general aviation airports, and $250 Million for the 3 commercial service airports. OAC is a non-appropriated state agency funded by 3 sources of aviation-generated revenues: the aircraft excise tax of 3.25% that provides, on average, 92% of OAC’s annual revenues, aircraft registration fees that provide 6% of OAC’s revenues, and the aviation fuel tax of 0.0008 (8/100ths of 1 cent)/gallon. OAC’s average annual total revenue for the last 5 years is $5.1 Million. OAC invests 83% of its average annual revenue in airport infrastructure across Oklahoma. The average annual investment from all sources of revenue (federal, state and local) in the OAS over the last 5 years has been $50 Million ($40 Million-federal, >4 Million-state, and >$5 Million-local). Total anticipated revenue for the next 20 years is $1 Billion. All airworthy aircraft based, or primarily used, in the state for more than 30 days in a calendar year must be registered with the Oklahoma Aeronautics Commission by completing and submitting an Aircraft Registration Application form and paying the applicable annual registration fee to the Oklahoma Tax Commission. 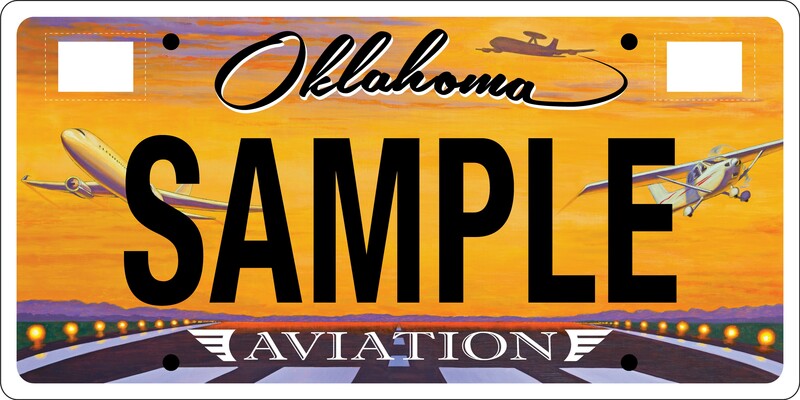 The Oklahoma State Aviation License Plate will highlight the importance of the state’s aviation system, and will raise funds to support aviation and public-use airports in Oklahoma. The cost for the aviation plate would be $35. Of that fee, $11 would cover vehicle licensing fees and the remaining $24 would support aviation-specific initiatives. Before the plate is moved intro production, 100 pre-paid registrations must be recorded with the Oklahoma Tax Commission within the first six months of sales.